Bold, vibrant nail polishes (like Sally Hansen Miracle Gel Beatnik) are my jam, but I don’t skip past an opportunity to try out a softer colour like Sally Hansen Miracle Gel Cream of the Crop because it works as a delicate palate cleanser! Spring is a great time to rock pastels and beiges, but as I always say, feel free to wear whatever you want whenever you want. Nail polish is about self-expression and the freedom to experiment with colour. Have fun, and strive for happiness instead of perfection! This entry was posted in Nail Polish Swatches & Reviews, Product Reviews and tagged Sally Hansen on April 19, 2016 by Mary S..
Sally Hansen Miracle Gel Beatnik is a full-bodied blue that might just steal the Cookie Monster’s attention away from baked goodies! Featuring a formula that promises to deliver the high shine of a gel manicure and great wear without the need for a UV light, Sally Hansen Miracle Gel Beatnik was a must-try for me. I’ve never had gel nails, but I’ve often admired the killer shine on others. This is my very first experience with any Sally Hansen Miracle Gel nail polish. Did it live up to its promises? 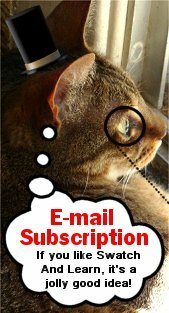 Find out in this post! This entry was posted in Nail Polish Swatches & Reviews, Product Reviews and tagged Sally Hansen on April 13, 2016 by Mary S.. Although I rarely make New Year’s resolutions, I decided to make one for blogging. I was going through my old computer files and came across a few manicures and product photographs that never made it on here. I plan to go back, and let them all see the light of day. Back in October, I punched up a pink manicure with some glitter. I came across photos of Sally Hansen Fa-la-la-lavender layered over Nicole by OPI Carnival Cotton Candy (from the Carrie Underwood Collection). 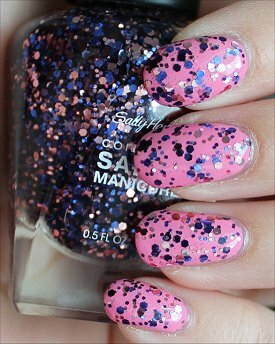 This entry was posted in Nail Polish Swatches & Reviews and tagged Sally Hansen on January 2, 2014 by Mary S..
You may remember that not long ago, I reviewed and swatched No S-pear Time. Well, it was from the limited-edition Sally Hansen Insta-Dri Fast Forward to Fashion Collection! There are 8 shades in total, and even though the press release I’m going to share with you today says they’re available in September, I’ve still seen them sold at Shoppers Drug Mart. And I’ve confirmed with PR (who sent me the promo pictures and information) that these shades are indeed still in stock. So, that’s great news if any of them interest you. 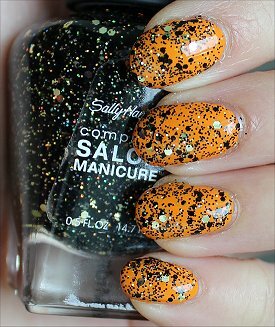 This entry was posted in Press Releases & Promo Pics and tagged Sally Hansen on October 9, 2013 by Mary S..
You know what? 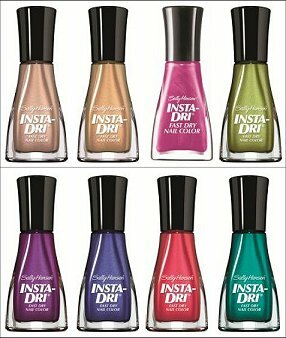 I has been ages since I tried any of the Sally Hansen Insta-Dri nail polishes, and it’s very strange because I’m nearly always tempted to bring one of the shades home with me whenever I frequent the drugstores. Okay, so I may be biased about loving No S-pear Time, but it really blew me away. Allow me to explain further in this post. This entry was posted in Nail Polish Swatches & Reviews, Product Reviews and tagged Sally Hansen on September 27, 2013 by Mary S..
Sally Hansen Midnight Glitz is one of the amazing, glittertastic nail polishes in the Wonderlust Holiday Collection, which will hit stores in November. This nail polish is marketed as a layering polish, so that’s exactly how I chose to wear it. Haha, and it didn’t take long for me to come up with a colour combination! Although this sparkle diva is supposed to be more for the December holidays, I was itching to give it some Hallowe’en flavour. (After all, my favourite holiday is Hallowe’en!) So, I went with a pumpkin-friendly orange, China Glaze Papaya Punch. The overall effect is exactly what I was aiming for, and it’s making me look forward to October 31st even more! 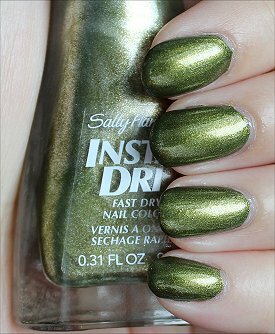 This entry was posted in Nail Polish Swatches & Reviews, Product Reviews and tagged Sally Hansen on September 24, 2013 by Mary S..
Yup, the holidays are quickly approaching! The other day, I went to the grocery store and already saw a large display of Christmas decorations. It’s not even Hallowe’en yet, but, of course, retail stores need to plan ahead and market products in advance. Here’s a taste of the new Sally Hansen Wonderlust Holiday Collection that will be in stores this November! 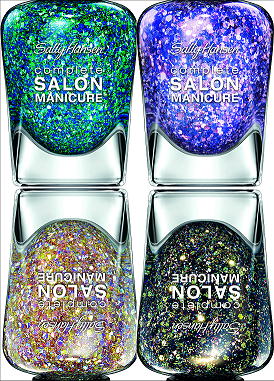 These glitter nail polishes look like they’d be really fun to layer with and create playful holiday manicures! I put together this little collage of the colours because I think they look pretty together. Which stand out the most to you? 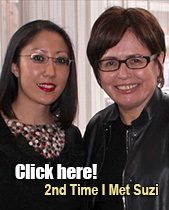 This entry was posted in Press Releases & Promo Pics and tagged Sally Hansen on September 19, 2013 by Mary S..